You are here: Home / The Best Website Builder For Your Website / IM Creator Review: How Does This Website Builder Measure Up? IM Creator Review: How Does This Website Builder Measure Up? As one of the relatively new kids on the block when it comes to website builders, IM Creator boasts a simple platform that's easy to use. The website builder is one of the fastest we've tested, with several templates that can get sites live and published in a very short time frame. Those fast templates don't look like they were put together quickly, either. While IM Creator is fast and offers excellent templates, we did encounter a few bugs. Add in the fact that there's no eCommerce option or viable blog platform, and it's not suited for every business owner, though many will certainly find IM Creator to be the right fit for effectively building an online presence. The IM Creator platform gives users two options right from the start: choosing a template or starting with a blank site. (New users aren't actually prompted to create an account until they are ready to save their work.) Few website builders actually allow you to start with a blank site, and while it's just for advanced users, that option for customization is available and doesn't involve purchasing expensive software. IM Creator has a wide variety of templates available, all with a clean, professional design. Along with business categories ranging from services to fashion, the platform also includes options for a “5 Min. Site” and one-page templates that are designed specifically for getting a site live quickly. Choose your template carefully, though—users can't change the template without starting from scratch. Where some builders will change the design while still leaving most of the text, images, and other items intact, with IM Creator you have to start over to change the design. Choosing a template takes you to a full website that's filled in with dummy text and stock images—which is why it's easy to build a page quickly with IM Creator. Users can do more than just change text and images to customize their look, but it's possible to just swap out text and images to get a website up fast. Existing elements are edited simply by clicking on that item in the editing mode. With the object selected, options appear at the top of the screen. The options for editing an image, for example, include crop, set info (to adjust SEO details), social (to show the like button) and one-click size adjustments for fill, 1:1 and fit. 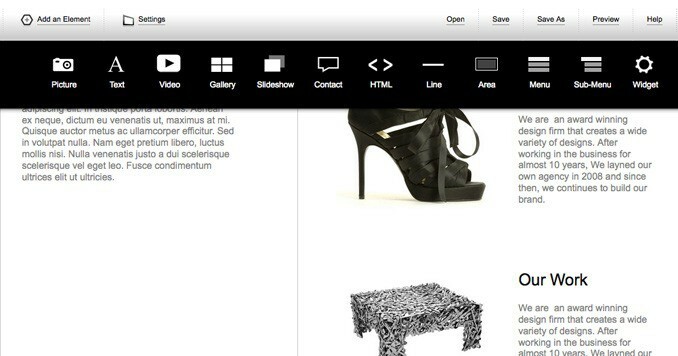 IM Creator is a drag and drop style editor—items can be rearranged by clicking and moving them around on the page. Some website builders work in blocks, where objects cannot overlap, but IM Creator allows users to layer items over each other with options to bring them to the front or back. 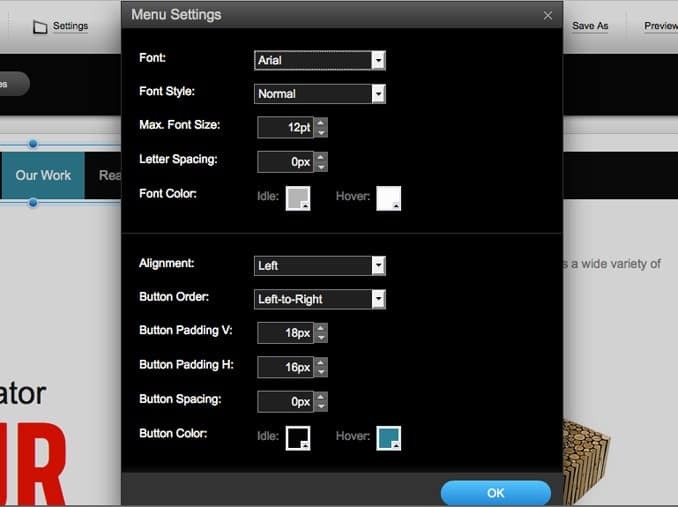 Items not built into the template can be added easily with the “Add Elements” option at the top. Click one of the options (which includes picture, text, video, gallery, slideshow, contact, HTML, line, area, menu, submenu and widget) and that item will appear on the page, where users can drag items to the desired spot and then proceed to edit. Since the templates are designed to get sites running as soon as possible, adding a new element often means the page length needs to be adjusted—that's done under the settings option at the top of the page. The settings key also brings up options for more advanced features like adding SEO details and integrating Google Analytics to track the site's visitors. Most changes, however, are done simply by clicking on what you see in the editor, making it a simple platform to use. Most templates have a few basic pages already added, but additional pages can be added easily as well, using the pages options that's right next to the Add Element in the top menu. We like that there are two options here: starting with a blank page or starting with a template that already includes a few elements. Or, users can even head into Manage Pages and duplicate an existing page. Again, that helps make designing a web page a little faster. Unfortunately, adding storefronts and blogs is where IM Creator starts to fall flat. There's currently no option to add an online store, not even within the available widgets. Blogging isn't much better. A Tumblr widget allows users to import an existing blog, though we couldn't get the widget to work, despite trying it out on three different web browsers. The Help Center includes a detailed article on how to directly add blog posts—by adding each and every element individually through text boxes, then going through and linking to an archive page. Sure, that means blogging with IM Creator is possible, but it completely negates the main perk of the platform, which is building a website quickly. Adding a blog to separate text boxes, comment fields and other options would take significantly longer than just using something like WordPress. Sites can be designed with IM Creator for free. Domain and hosting to get a .com address costs $7.95 a month, which is a pretty reasonable price. While the platform is easy to use, the Help Center is available whenever users have questions. The center includes articles and forums, as well as an email to ask specific questions. The email response wasn't as speedy as the others that we've tried, but we still received a response in less than 24 hours. The biggest advantage of IM Creator is that websites can be built very quickly, yet don't appear to be haphazardly tossed together. The designs are excellent, yet the platform is easy enough to use for DIY sites. The drag-and-drop style makes it simple while the templates keep it fast. Unfortunately, there's currently no option to add an online store. And while technically users can add a blog, it's way more complicated and time consuming than other platforms that include a WordPress-style builder right inside the platform. When users are ready for a new look, they also have to start from scratch with a brand new site, as there isn't an option to change the template. So who is IM Creator for? Businesses that want to get online quickly and easily, but don't need a storefront or a blog will likely love IM Creator for its simplicity, speed and excellent templates. For starting an online store or blog, however, we recommend looking at another option such as Weebly.